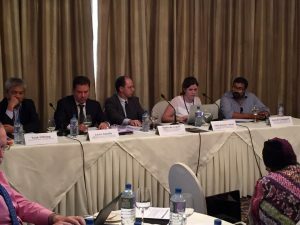 On November 9-10, 2016, the UN Special Rapporteur on the promotion of truth, justice, reparation and guarantees of non-recurrence, Mr. Pablo de Greiff, organized an event to facilitate a regional consultation on transitional justice in the Asia-Pacific region, held in Colombo, Sri Lanka. The Director of the Educational Policies Program of the Auschwitz Institute for Peace and Reconciliation (AIPR), Dr. Clara Ramírez-Barat, was invited to participate in the program in order to share her experiences and expertise with the Special Rapporteur and other participants. The event, the last in a series of five regional consultations carried out by Mr. de Greiff during his mandate since 2012, served to bring together State representatives from the Asia-Pacific region as well as experts representing transitional justice mechanisms, national human rights institutions, and non-governmental organizations, including victims’ groups, in order to learn about the current challenges that transitional justice policies face in the region. To accomplish this goal, the program featured four thematic panels related to each of the themes of the SR’s mandate as well as segments providing opportunities for relevant open discussions. 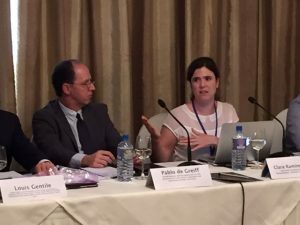 Dr. Clara Ramírez-Barat participated in the event’s final panel entitled “The Three Dimensions of Guarantees of Non-Recurrence”. Moderated by Special Rapporteur de Greiff, she was joined on the panel by Mr. Louis Gentile, the former Chief of Human Rights and Transitional Justice of the United Nations Integrated Mission in Timor Leste; Mr. Youk Chhang, Director of the Documentation Center of Cambodia; and Mr. Ananda Galappatti, Co-founder of the Good Practice Group and Visiting Lecturer at the Faculty of Graduate Studies of the University of Colombo in Sri Lanka. Dr. Ramírez-Barat, for her part, spoke about comparative experiences related to the teaching of history during, and in response to, situations of national transition after periods of conflict or massive repression and human rights abuses. Drawing on research recently published in an edited volume entitled Transitional Justice and Education: Learning Peace, Dr. Ramírez-Barat’s presentation focused on how the legacies of conflict affect the education system of a country and, accordingly, how education reform policies can be framed in order to help build stronger democracies and stronger peace. 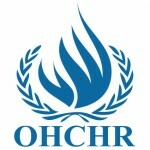 Having followed the work of the UN Special Rapporteur on the promotion of truth, justice, reparation and guarantees of non-recurrence for several years now, I am especially satisfied to see how the mandate has consistently insisted on looking into the broader socio-cultural sphere, including the role of education, when thinking about issues related to the prevention of the recurrence of violence in societies overcoming mass atrocities.” As AIPR continues to build its Educational Policies Program, opportunities to engage in international forums of this sort to discuss about different experiences and best practices are extremely valuable.